Villagers vented their fury at the government during a packed public meeting held last night in one of the parish churches directly threatened by a proposal to abandon six Broads villages to the North Sea. 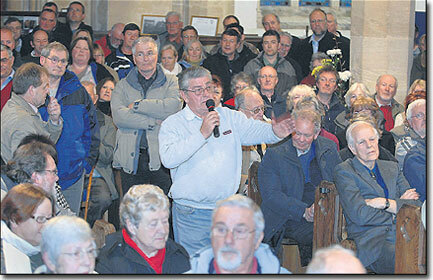 Around 400 people packed into St Mary’s Church in Hickling to decide how to react to possible plans revealed in the EDP at the end of last month which could see hundreds of homes, thousands of acres of farmland and some of the county’s top wildlife sites surrendered to the sea. Under the proposal – one of several which has so far only been considered behind closed doors by the agencies involved – 25 square miles of Norfolk could be flooded by a coastal breach and allowed to turn into salt marsh and reed beds. The villages concerned are Hickling, Horsey, Sea Palling, Waxham, Potter Heigham and Eccles. At last night’s meeting it was revealed for the first time that the plan would affect 600 homes, a figure obtained by North Norfolk MP Norman Lamb through direct discussions with the Environment Agency and Natural England, two of the key bodies involved. The meeting was the first of three and provided the first opportunity for the public to discuss and debate the deeply controversial plans. Concerns centred around property blight, the fact the proposals had so far only been discussed secretly and whether it would be possible to take the government to court. The first person to speak was Peter Boggis, who has become well known for his fight to save his home from coastal erosion at Easton Bavents, near Southwold. “There is nothing more natural for a man to stand up and fight for his home and the way of life he enjoys,” said Mr Boggis. Mr Boggis said the government agencies involved had failed to “respect property or human rights” and said they actions were “almost criminal”. Chris Hall, a Horsey parish councillor, said it was important to include the “whole of Norfolk” in any battle with the government over the issue, as it was something which concerned a much wider area than the six named villages. Chris Hollis said he was “appalled” by Natural England’s comments about habitat and failure to mention jobs, homes or history. “Are the Dutch giving up part of their country like this?” said Mr Hollis. Hickling resident Simon Mann said he had considerable concerns about the “clandestine manner” in which Natural England had behaved. “They should have come out of their hiding place,” said Mr Mann, who went on to make a lengthy argument about the Human Rights Act and the possibility of taking court action in the future. Dr Martin George of the Broads Society said the authorities were ignoring people in their discussions. He added that the much vaunted Option 4 of allowing the sea to encroach the six villages was not the only option which could cause problems for the area, insisting that three out of the four options were seriously problematic and the other was only less damaging. None of the four options were acceptable, said Dr George, and the only satisfactory solution was to strengthen the existing sea wall. 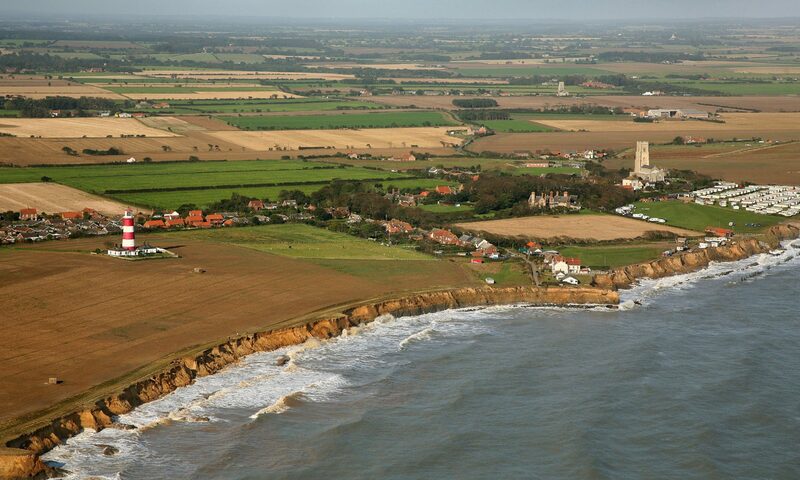 Malcolm Kerby, coordinator of the Happisburgh based Coastal Concern Action Group, who called the meeting alongside Mr Lamb, said the concerns expressed at last night’s meeting would be “carried to the heart of government”. He added that he was “incandescent” at the recent actions of “government quango” Natural England. Mr Lamb said it was very important that the village of Hickling had demonstrated its feelings in such numbers and with such force. “We have got to do everything we possibly can to require government to defend this coastline,” said Mr Lamb. Natural England spokesman David Viner said earlier in the day that his organisation had planned to talk to the public about the plan later in the year.